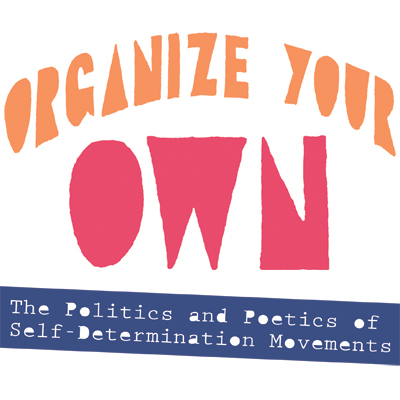 The book, Organize Your Own: The Politics and Poetics of Self-Determination Movements, features new work by contemporary artists, poets, and writers that relates to the Black Power movement’s mandate to “organize your own” community against racism. Exploring the question of what “your own” might mean, this book connects some of the concerns dealt with in the 1960s and ’70s to the conversations and social movements around racial justice happening today. With contributions by: Amber Art & Design, Rashayla Marie Brown, Emily Chow Bluck, Billy “Che” Brooks, Salem Collo-Julin, Irina Contreras, Brad Duncan, Bettina Escauriza, Eric J. Garcia, Maria Gaspar, Thomas Graves, Robby Herbst, Jen Hofer, Aletheia Hyun-Jin Shin, Mike James, Marissa Johnson-Valenzuela, Jennifer Kidwell, Antonio Lopez, Nicole Marroquin, Fred Moten, Matt Neff, Mark Nowak, Edward Onaci, Dave Pabellon, Mary Patten, Rasheedah Phillips, Anthony Romero, Frank Sherlock, Amy Sonnie, Hy Thurman, Thread Makes Blanket, James Tracy, Daniel Tucker, the University of Louisville’s Anne Braden Institute for Social Justice Research, Dan S. Wang, Jakobi Williams, Mariam Williams, Rosten Woo, Wooden Leg Print & Press, Works Progress with Jayanthi Kyle, and Rebecca Zorach. Major support for Organize Your Own has been provided by The Pew Center for Arts & Heritage, with additional support from collaborating venues including The Averill and Bernard Leviton Gallery at Columbia College Chicago, Kelly Writers House’s Brodsky Gallery at University of Pennsylvania, Slought, Asian Arts Initiative, Museum of Contemporary Art Chicago and others.